Blue Mail Media’s Utilities Industry Email Database is an ideal option for utility service providers in the segments such as electricity, natural gas, water, sewage, broadband internet services and more to explore massive opportunities for business. 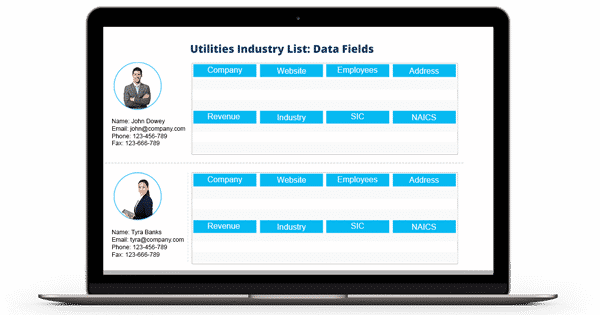 Our Energy and Utilities Industry Executives List enables you to connect with your target audience and flawlessly implement your multi-channel marketing campaigns using the medium of your choice. Establishing business networks with organizations and professionals in the energy, utilities and power industry is a significant task for direct marketers. Blue Mail Media’s Utility Industry Professionals List has been designed to provide you the required momentum to carry out your marketing operations and drive conversations, conversions and RoI. Blue Mai Media has a well established presence across the US, UK, Europe, Russia, China, Australia, India, New Zealand, Canada, North America amongst others. This enables us to serve clients across the globe without regional barriers. We also give our clients the liberty to choose from our pre-packaged Public Utilities Mailing List or opt for a customized list based on your campaign specific objectives. We put immense efforts in collection, verification and update of our databases so that you achieve maximum results in your marketing engagements. Blue Mail Media gives you enough flexibility to either choose from our pre-packaged Utilities Industry Mailing List or get a customized list created as per your campaign specific requirements. With our data, you are sure to realize greater response rate, conversions and a healthy ROI.